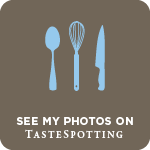 Am running this week's blogging marathon with Dish under 30 minutes as theme, and needless to say that i will be posting three different and easy breezy dishes for this week's theme. 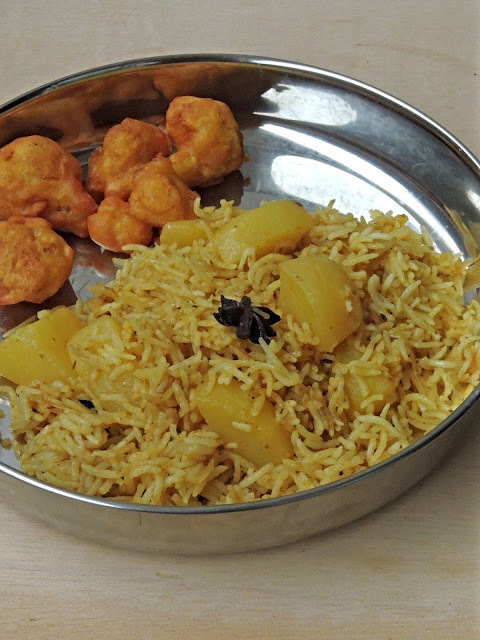 Hence am kick starting this week's theme with a flavourful Potato pulao. This pulao takes less than 20 minutes to get ready. 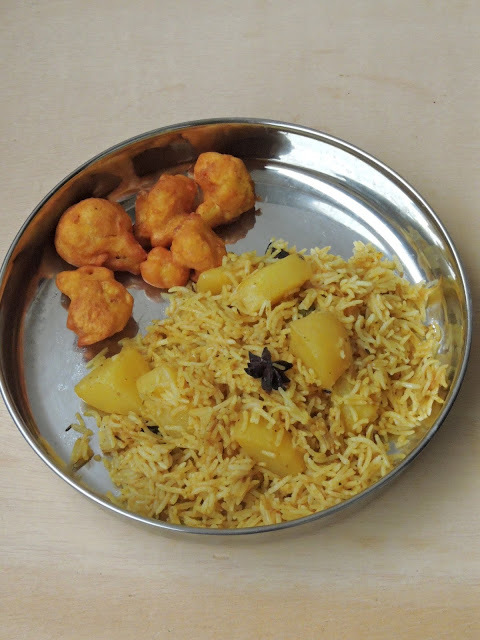 Since this one pot meal calls for Indian pressure cooker, trust me you make this pulao easily. Apart from chopping onion and potatoes, you doesnt need anything exceptional to do with. 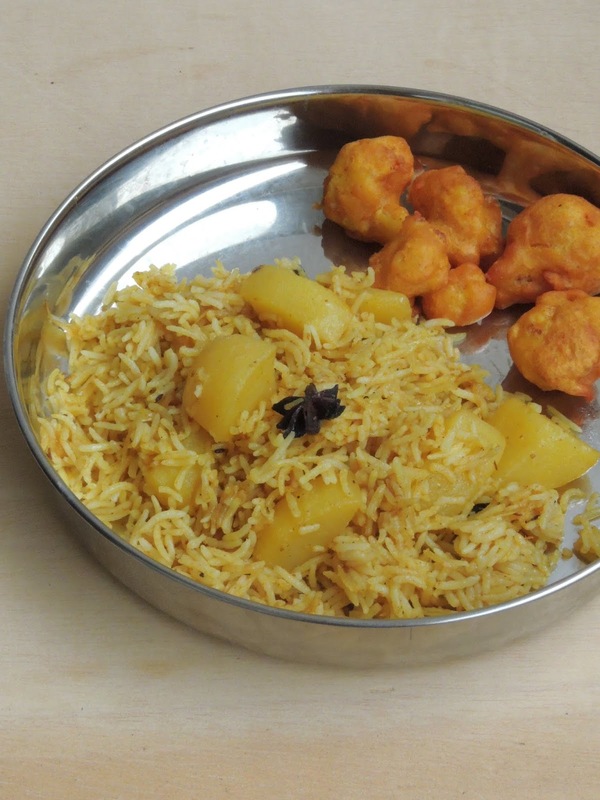 Served along with a gourmet gravies, one can enjoy this pulao without any fuss. I used cubed potatoes, in case if you want more healthy and colourful, dont forget to add mixed vegetables to this same pulao. Wash and soak basmati rice for 5minutes with 4cups of water. Meanwhile heat enough oil in a pressure cooker, fry the bay leaves, shah jeera, star anise and cardamom. Immediately add the chopped onions with salt,cook until the onions turns transculent. Add the chopped potatoes and sauté along with garam masala powder, pepper powder and cumin powder, until the potatoes get half cooked. Strain the soaked water from the basmati rice and add to the cooking veggies, bring to boil. Once the steam get released, with a fork, fluff the rice. Serve along with papads, raitas. Pulaos are a saviors when pressed for time. With some raitha or jsut plain yogurt, it is a filling meal. That is such a simple and quick to make pulao. My kids will love this with potato in it. Will make this for them some time soon. Anything with potato is a favorite dish at my home. Pulao looks simple and delicious. I really need to try this one Priya. It will be so good for the kids lunch box. They love potato and it will surely be a hit! 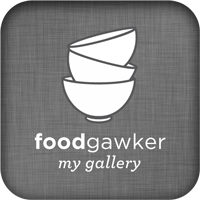 Pressure cooker is a much needed gadget in my kitchen too. It makes life easier. 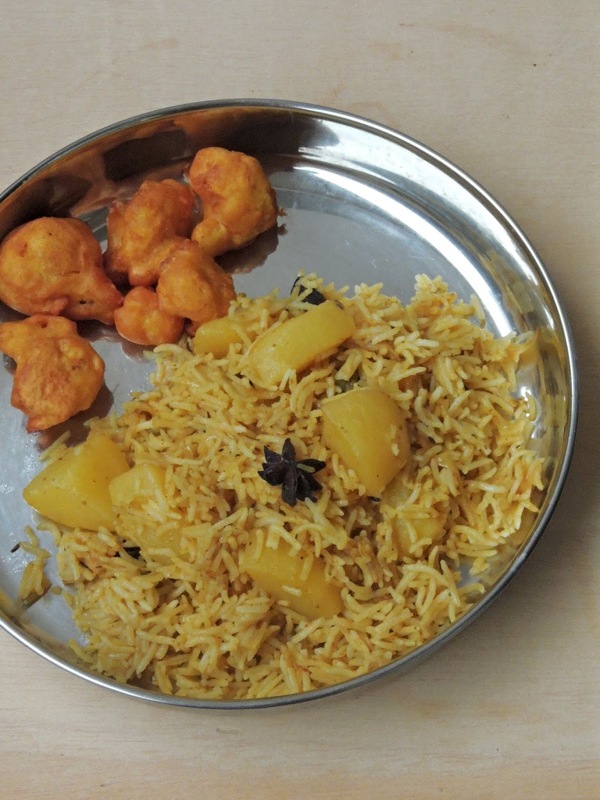 This pulao looks awesome Priya. I need to learn the cooking of rice in pressure cooker. Whenever I make it turns mushy. That's really a very quick one to make Priya, comes handy when you have to pack for kids lunch box!